Since attaining sainthood, Jeanne Jugan has been showing up in some unexpected places! In August she took up residence at Creighton University in Omaha, Nebraska; last week she found a home at an out-of-the-way shrine in Manorville, a small town on Long Island. The idea of bringing Saint Jeanne to the Shrine of Our Lady of the Island was born last year when a delegation of Little Sisters visited the Montfort Fathers’ shrine. Rev. Roy Tvrdik, SMM, the shrine’s director, showed them the newly established “Avenue of the Saints,” (which is actually a footpath through a wooded area), and several Little Sisters began to entertain the idea of bringing Saint Jeanne to the Avenue. Efforts soon got underway to make the dream a reality, procuring a bronze statue of our foundress from Spanish sculptor Angel Acosta. October 3rd was chosen as “dedication day” in order to commemorate the 30th anniversary of Jeanne’s beatification. 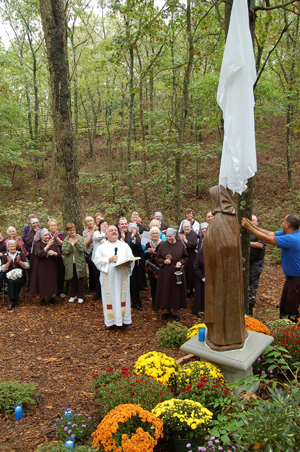 The Montfort Fathers had taken care of having the statue set on a pedestal in the woods, not far from the statues of Mother Teresa of Calcutta and Saint Therese of Lisieux. The Little Sisters from Queen of Peace arrived early to arrange potted mums around our Saint; they also placed an expertly rigged veil over the statue. (The white veil included a hook, to which was tied a roll of twine. The twine was then looped over a tree branch overhead. The plan was for Mother Provincial to unveil the statue by pulling and winding the twine, thus raising the veil off the statue. When the time came it worked perfectly!). The day was a bit damp, but the rain held off, thanks to St Joseph’s intercession!